“I’m very impressed with the finished show apartment which is very warm and welcoming. The Local Authority has invested in a number of excellent partnership initiatives enabling people from across the County to live well in the later stages of life. 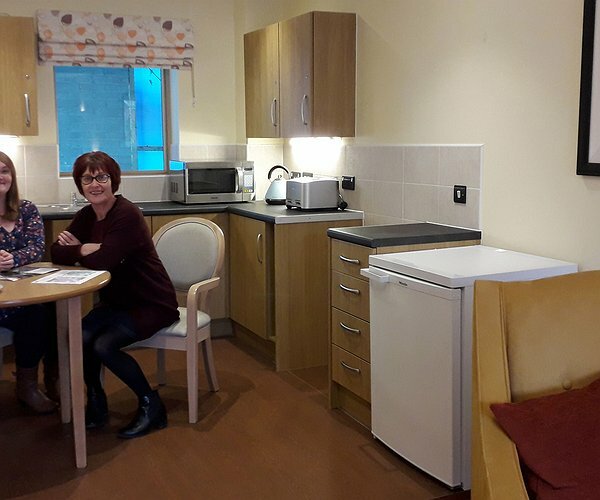 “It is a real privilege to meet with visitors and those who want to find out more about the possibility of renting one of the apartments, either for themselves or a family member. The scheme is due to open mid to late Summer 2018 and applications are currently open for those interested in renting one of the apartments, subject to eligibility criteria. “Applicants must be aged 60 or over and either live in Wrexham County or have very strong links to the area. There must also be some level of assessed care and support need, which can range from someone needing just a little extra help and reassurance to those with more complex physical, sensory or memory related support needs. “Living in an Extra Care Scheme enables people to maintain or even enhance their independence whilst living with varying care and support needs. It’s an adaptable environment that helps promote the well-being of tenants,” Gaynor added. Maes y Dderwen is a partnership development between Wrexham County Borough Council, the Welsh Government and TŷGlas Housing Society, part of the Pennaf Housing Group. The scheme has been partly financed through Welsh Government Vibrant and Viable Places (VVP) and Social Housing Grant secured by Wrexham County Borough Council, along with private finance arranged by the Pennaf Housing Group. A series of drop-in information day events are also continuing at Wrexham Museum in Lord Street on April 16, 23 and 30 between 10 m and 4 pm for people to call in and find out more or arrange a visit to the show apartment. "Great response to new extra care housing scheme"